where have u got the 1301 from? on asus site its still 1102. just wondering here. nice job! works nice. set llc to 7, bclk to 135 and booting fine. is more possible with standard cooler? any guide out there for z170? thanks in advance. i have a Asus Z170 Pro Gaming and an i5 6400.
i updated the bios with the mentioned one on this page, but i cannot see the “extreme tweaker” i still have the AI tweaker and im missing the Boot Performance Mode -> Turbo Performance. this one is not showing to me. i tried this 2 times…no success. PC is not booting up and i cannot go stable with him. also, do i need to set the jumper on the motherboard to over voltage position pin 2-3? 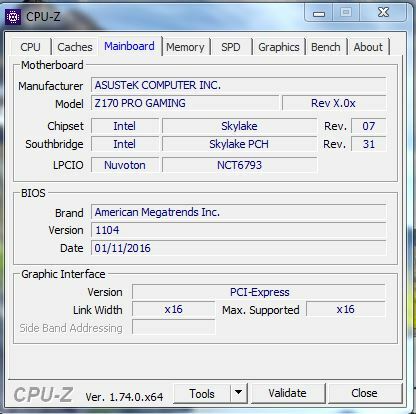 now it is set on pin 1-2.
according to the screenshot you’ve provided, you still have a standard ASUS BIOS 1104 dated this January. I also have Asus Z170 Pro Gaming and it’s running at 140 MHz bus speed at the moment. I wasn’t able to find the mentioned menu item “Boot performance mode”in its’ place below the Cache Line Prefetch, nor anywhere on the Advanced page (or other pages). Anyway, I’ve spent a couple of hours trying to find an explanation of the missing item, and after finding none, just overclocked my i5 6400 without Turbo Performance. According to CPU-Z Multiplier stays at 27, not 33 as it supposed to be in Turbo mode, and the core speed is around 3780 MHz. It’s enough for me (for now). I took the screenshot after i turned to the original bios. i posted it just as a confirmation for the MB i use. Myself i checked every tab there for that option. i still cannot make it boot. can you make a youtube video of the settings you have, maybe im doing something wrong. There’s a link above called “Detailed ASUS Z170 Non-K OC Guide”. I’ve used most of the hints written there, and I also watched two or three videos on Youtube related to non-K CPU’s overclocking just to get an idea of what different people do. I’ve opted for a mild usage of LLC (lesser than in the formentioned article) because my OC is less extreme and I don’t want any extra heat. I also kept CPU core voltage below 1.3 V even while on full-load by Prime95. As for memory modules, I upped their voltage just a litlle above 1.2V and kept them within their specs on frequency and timings. The memory modules, btw, are from the motherboard’s compatibility table and have an XMP profile. I’ve an impression from what I’ve read on the internet this mobo is very picky about the memory you install. Also, I presume you do have a dedicated Video board and you loaded Default settings after installing new BIOS. Please tell me, on this motherboard the i5 processor 6400 to how many MHz can I overclock with air cooling (e.g., CPU fan arctic i30 or i32, Cooler Master Hyper 412S, Thermaltake Contac 21) ? Thanks! any chance the z170i pro gaming mitx will get a bios update? will it work with i5 6500? I allso have have the AI tweaker and im missing the Boot Performance Mode -> Turbo Performance after flashing to 1301??? I have ASUS Z170 Pro Gaming and G4400. I have integrated graphics, is this a problem? Do I need dedicated graphics card? If you are planning to install current Non-K BIOS, then apparently yes, you do need a graphics card. Having AI Tweaker instead of Extreme Tweaker and im missing the Boot Performance Mode -> Turbo Performance after flashing. Dominik, you don’t need to have “Extreme Tweaker” and ” Boot Performance Mode” menu items to overclock this mobo. This part of the descriprion was just mindlessly copy-pasted from one for a different motherboard (probably Maximus series). More importantly the system starts working at high BCLK settings. Mine is at 150 MHz ATM, while with standard BIOS it wouldn’t go above 104 MHz. I also hope they fix the issue with not having turbo mode multiplier enabled, but it works OK even without it, it’s just you don’t see the right resulting CPU clock while settings BCLK in the BIOS. Any chance for a new upgraded bios ? Just checking in to let you know there is still interest for a new BIOS. I know you don’t have control over all the factors, so I am not trying to pester asking for an update. But just a hello and a big thank you for the work you have done. I got my Z170 Pro Gaming and I5 6500 months ago, and have had a lot of fun tweaking. I did not plan on an OC, but I knew there was talk about being able to do so on non-K versions. After I got my rig running, I found your postings and help, and let me tell you, awesome! I really should just get a 6600K, but I love the tweaking and tinkering. I am coming from a DFI DK P35 T2RS with an E4500 (My worst intel chip! ), an E8400 (LOVED THIS ONE!) and a Q9450 (3.8 24/7 stable for the past god knows how many years.) So a big Thank you! And if there is any updates, I am checking in every couple weeks! did they state why they won’t release anymore? It was working for me for some time then I had overclocking failed error so I installed the original bios version 1805 and I want to go back to 1301 but I can’t update it, because it says that it’s not bios file or something. Same thing while I’m trying to install older asus bios version. Any ideas? I have the same problem, how can I flash the 1301 bios? can you make a new OC Bios for us? Use this process to downgrade I did it on the z170 pro gaming and it worked. what’s wrong with you BIOS version 1301??? I have it running at 4200mhz with EVO212. Stable and not too hot. I’d try 4500mhz, but didn’t find time yet to test it out. And what is there to check??? just increase the BLCK up to 170-178Mhz. Or am I missing something??? First you have to follow http://overclocking.guide/asus-z170-non-k-overclocking-guide/ to set up all settings as described there and then just increase BCLK. Start with 140 and then boot, test, watch temperature, restart, increase BCLK, boot, test, watch temperature. Until you find the most stable BCLK for your case. Mine works fine with BCLK 150. Since it’s enough for me I just stopped at 150. Ok. Thank you. I chose the processor core i5 6400 and motherboard asus z170 pro gaming, I need to do is choose the cpu coller fan (only air coolling) and the RAM. fan need at least 27 to 29 decibels noise level in the load, only to be well cooled. a memory of 32 gigabytes. Here’s the question – better for overclocking 2 to 16 GB or 4 to 8 GB??? It doesn’t matter how much RAM you have for overclocking. But I recommend to have at least 8GB nowadays. I have 16GB, just because supplier didn’t have 8GB kit when I was upgrading my PC. I’d suggest you to buy EVO 212 cooler, it’s cheap and very quiet and reliable. Then go with at least 16GB if you’re looking into the future. I did buy Kingston FuryX just because it was the one available at the store CL12 RAM (Kingston HyperX Savage Memory Black DDR4 2x8GB, 2400MHz, DIMM, CL12). If you’re going to use your PC for gaming only 16GB is enough for at least following 5 years. Regarding cooler, you can go with liquid cooling if you have enough budget for that. I didn’t go with liquid as I didn’t want to invest too much. I have a PC with processor core 2 quad 9550 overclocked to 4.1 GHz. Is it worth to change existing and running for 8 years (2015 to replace all thermopaste and thermal seals, and lubrication of all valves or grease lubrication) core 2 Quad 9550 (overclock a 4.1 GHz) on mother Board ASUS Rog Х48 LGA775 rampage Extreme + DDR3 8GB core i5 6400 and overclock to 4.6 GHz, especially for gaming tasks. If you change the CPU, mother Board and memory. (The video does not change – ASUS STRIX-GTX1060-6G-series ROG). In this videocard, FPS on max options in World of Tanks – 100-120, World of Warships- 45-60-70 fps. Is there any sense to change core 2 Quad 9550 (4,1 GHz) core i5 6400 (4.6 GHz)????? Very thanks for all you!!!! Due to newer version of Bios flashed in the motherboard EzFlash Utility do not accept this BIOS file. Can you make a new OC Bios for easy update? Anyone going to put here the BIOS that will fix a bug of no “extreme Tweaker” and “load mode -> Turbo Performance”??? Does this BIOS work with the Gaming Pro/AURA, although the boards look virtually identical, will it still work? Will this work with the z170 pro gaming aura? Hi Any spectre meltdown patch for the bios?????????? hghvcqwk,If you are going for best contents like I do, just go to see this web page daily because it offers quality contents, thanks! rqrebrln,Some really nice stuff on this website, I enjoy it. vjinrbu,Your blog was informative and valuable to me. Thanks for sharing. rzobzkcibhg,Thanks a lot for providing us with this recipe of Cranberry Brisket. I’ve been wanting to make this for a long time but I couldn’t find the right recipe. Thanks to your help here, I can now make this dish easily. xeikkvbz,Quality blog, keep up the good work. You may check our website also! esxnfwfiiql,Your blog was informative and valuable to me. Thanks for sharing. psqpbntb,Hi there, just wanted to say, I liked this article. It was helpful. Keep on posting! zylufru Yeezy Boost,Waw! Its really great and wonderful ever i found. Thank you for sharing this info. fdicxrml,Thanks for sharing such an amazing blog. I am so happy found this informative blog. shfajmis,If you have any struggle to download KineMaster for PC just visit this site. alopyyg,If you are going for best contents like I do, just go to see this web page daily because it offers quality contents, thanks! enyxra Yeezy 350,Hi there, just wanted to say, I liked this article. It was helpful. Keep on posting! Download doesn’t work for me could you please check if it’s still hosted properly. ysdtffxxs,Hi there, just wanted to say, I liked this article. It was helpful. Keep on posting! xphnnpqkown,If you are going for best contents like I do, just go to see this web page daily because it offers quality contents, thanks! xcyekorjap,Definitely believe that which you said. Your favourite justification appeared to be on the net the simplest thing to remember of.